Tomorrow, the Sidewise Awards will be presented - they're the top award in the field of alternative history, and three of the writers from the Inklings Press collection Tales From Alternate Earths have made the shortlist for the Short Form prize. 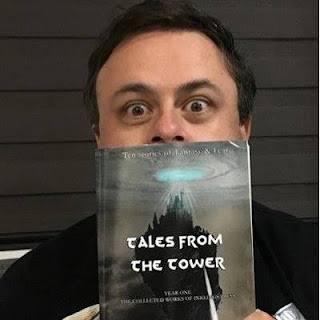 Here, we chat to Ricardo Victoria, co-author of the story Twilight of the Mesozoic Moon with Brent A. Harris, and Sidewise nominee, as he awaits the news of the winners. So – it’s been a year since Tales From Alternate Earths came out, and you’re up for a Sidewise Award, the biggest award in the alt history field and up against the likes of Bruce Sterling. How do you feel about the nomination? Excited, delighted, proud and at the same time, humbled. I mean, alternate history is not really my chosen genre so for me this is a really welcome nomination. I really want to win –it´s my competitive nature of which you are well aware- but at the same time I realize that just being nominated is a victory unto itself, especially for a debut story. I’m just happy. The Sidewise Award has a heady list of previous winners – including people such as Stephen Baxter, Walter Jon Williams, Lois Tilton, Gardner Dozois, Ken Liu… who are the great writers of alternative history who you admire and would say are influential? If I’m honest, I have read next to nothing on the genre. I know that sounds bad, but I had never considered writing alternate history until I joined Inklings Press. One of the nice thing about it has been being pushed to write outside my comfort zone, to discover new fields. Now I need to start reading more on the field. What’s next for you, win or lose? Get the final edit of my novel ‘Tempest Blades” and start shopping for an agent or publisher. With any luck, this nomination will help towards that endeavor. After that, I will work in my second alternate history –which will be a comedy in the spirit of Terry Pratchett, hopefully I will be able to pull it off - and the sequel of Tempest Blades. This nomination proves that my ideas are not that crazy… well, just a bit. Where will you be when the winners are announced? With my wife, probably waiting for the new episode of Game of Thrones, trying not to pull my hairs out of nervousness. Winners are coming! Okay, we’ll see how the final comes out. But in the meantime – Tales From Alternate Earths aside – if you were to name one alternate history book for readers to try out, which would it be? Just one. Yes, I’m being tough. Well, I still need to get my own list of books on the genre before recommending one. As I said before, I’m pretty much new on the genre. But if I’m allowed to be cheeky and shameless, I would recommend Tales from Alternate Earths. There is a reason it has two nominated stories. And its second volume when it comes out. Learn more about Tales From Alternate Earths here. Read about fellow nominee Daniel Bensen here. Read about fellow nominee Brent A. Harris here.